CM: The work of Costas Evangelatos entitled Adolescence is a multi-faceted work that took years to materialize. Initially in 2004 Evangelatos presented a series of photographic self-portraits against the forest of Chantilly in France. The next year Evangelatos photographed before an enlarged digital reproduction of one of these self-portraits an adolescent from the artist's homeland, Cefalonia. 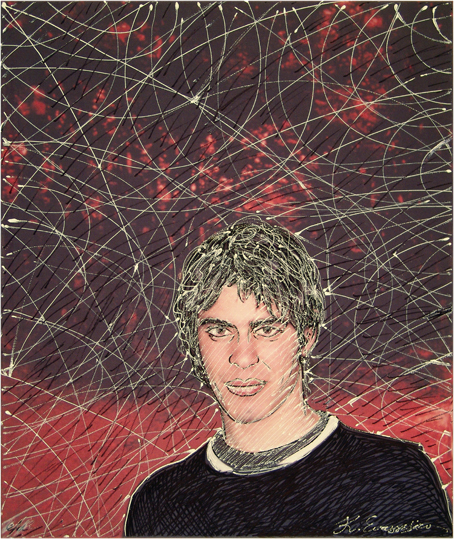 Finally in 2006 Evangelatos engaged on the digital picture with painting in an attempt to represent the psychographical condition of the contemporary adolescent. The multi-directional lines of paint on the face, the hair, the dress and the background of the work reflect the universal forces, energies and tendencies that describe contemporary adolescence.